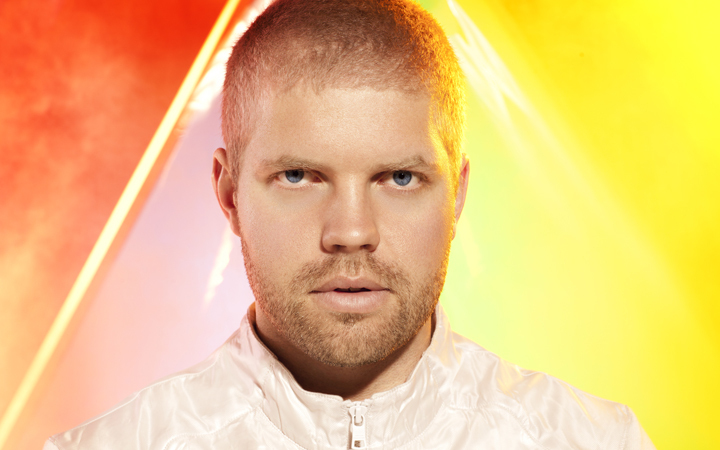 After developing a fascination for MIDI at a very tender age, Morgan Page soon became hooked on music technology. Now, the LA-based double-Grammy nominee is one of the hottest house DJs in the US, has a super-eclectic remix catalogue under his belt, and is currently producing his sixth studio album. He reveals to Headliner how he manages to stay up to scratch on all three art forms. Morgan Page: Actually, it was as early as middle school. I saw a demonstration of somebody using MIDI keyboards and samplers for the first time, and although I could never get my head around it, I thought it was something amazing, and really attractive to do – so I wanted to figure out how all that worked. That led to wanting to produce later on, and I started making music with computers with the tracking programs that were made for video games. I had this free program called the Impulse Tracker, and I would use grainy 8-bit samples - that was before I could afford samplers and keyboards, and things like that; and now it’s all gone back to computers again, as technology keeps changing. So it’s sort of gone full-circle? Yeah, really. I was just dabbling back then, and I started listening to college radio in high school, which is where I developed a real interest for electronic music. At the time, there was no way to discover the music; it was just what the major labels were funneling to the airwaves, so I got into college radio and mix shows and started DJing myself; and when I wanted to see my audience, I started touring and playing out. I was signed as an artist in 1999. I was DJing with vinyl at the time, and it was a really strange concept when I started DJing with files; I’d started to play with CDJs, and people were making good money spinning vinyl. I remember reading many magazines from the UK, sending demo tapes in over the years; at that time, DJing was far more popular in Europe. It was funny to watch it develop in the US, and it’s only now that it’s getting as popular as it should have been a while ago. I’m in the third year of my residency at The Wynn in Las Vegas – I do that twice a month, and what’s great about that is, you always have a different crowd every time you play. Definitely. I try to bring in folk and indie influences, and some alternative stuff. I think a lot of dance music can sound the same, and I’m trying to mix stuff that can set itself apart and last a bit longer. I was doing my radio show today – I do a show for [satellite radio station] SiriusXM here in LA, and there are so many tracks that sound similar. People want to sound like everybody else, which I find so bizarre, but a lot of guys just copy the formula. I try to make music that straddles different genres, even though it may work with a framework for the club or for festivals. How much crossover is there, work-wise? It has its balances with regard to studio time and travelling and touring; I do pretty much everything myself, from mixing to stem mastering. Occasionally, I will try to get some other ears on it, as it can be a little frustrating when you’re trying to do everything yourself all the time. But it’s tricky bounds, because I am a DJ and a producer and a remixer. I’m trying to do less remixes at the moment, and invest more in my brand, concentrate on my original work a bit more, as that’s the stuff that carries you the longest. The downside of remixing is that it’s just a marketing tool a lot of the time. It’s like going to boot camp: you can remix, you’re learning how to produce, and you’re seeing sessions; you’re seeing how to sample, and it’s really a complete learning experience. I was doing a remix recently for Daft Punk, and it was really cool to see their surround sound sessions and see how they were layering their stems. That was really a very rare peak into a very mysterious production duo. Your YouTube views are in the millions... Do you have a secret formula? [Laughs] It’s funny, because some songs really catch fire and get out there and grow legs, but some of your favourites don’t blow up at all. You have to trust your gut; some stuff catches, and you’ve got to keep cranking out consistent music that you’re fascinated with, and is important to you. But DJing is still your mainstay right now? It definitely takes up the most time, but what’s tricky is that the remix offers come in sort of randomly, so it can disrupt the creative cycle. But what I do love about remixes is that the creative process is generally much faster, so I’m not sitting there with writers arguing over syllables and things like that. I create an a cappella, create a chord progression around it, wrap it in some chords, make a beat, and I can do a remix in two or three days. But for originals, start to finish, writing lyrics, demoing, mixing and everything, it’s a couple of weeks. I keep it very simple live – there’s no plugins being used. I’m triggering clips; I’m doing a lot of crazy stuff with visuals; and we just did a 3D tour, which was really cool. The next step live would be to do some more with audio processing, but it’s more about stability right now. I could expand the setup to do more stuff like bringing in synths, but often there isn’t room to bring in a lot of gear, so I do edits and mash-ups on the fly. So what’s your setup on the road? Well, for live shows, I go straight from Ableton into my [Pioneer] DJM900 nexus. Most of the hard work is done ahead of time; right before the show I am doing the edits, the mash-ups, I’m changing the arrangements and the mix-down. I bring one computer, my portable studio, and one that’s my touring computer. What’s great is, I can make changes on the plane or at the hotel I’m staying in. I use a lot of the Waves stuff – the Mercury plugin bundle is right there, just on an iLock; and really, it’s all I need, just one dongle. Since it’s mainly triggering clips, I try to keep the processing load really low; but on the mash-ups and edits, I’ll often use an L3. 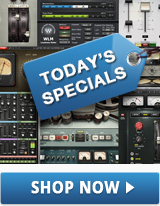 I also use the Waves stuff on my radio show – all the vocals, all the dynamic effects, the voiceovers, the ducking, the multiband compression on the mix – all that stuff is done on the fly. It’s great not to rely on the hardware; I just bring a USB mic on the road and it goes through Waves plugins such as the 1176, the Pultech EQ, the H-EQ, and it’s just great. I take it on the road, and you have a great sounding voiceover; even though the mic isn’t the best in the world, you can make it up in plugins. For the voiceovers, I record the vocals really low; a lot of engineers are doing this, because the sweet spots are set for -18 dB, which is really low on the vintage gear, and that applies to the plugins. I find it really useful to set my levels quite low on the mic so we’re averaging zero; it leaves a lot of headroom. Yeah, it is. It makes it feel a little more real. I start with synthetic elements most of the time, as there’s nothing worse than playing an acoustic guitar track and then finding it’s out of tune! Then I add the live stuff afterwards. The problem now is that everybody’s using the same samples in electronic music and it’s important to get away from that – at least layer it or stack it, you know? Do you think people can get lazy because sounds are so easily accessible? It’s a step further than people being executive producers on records, I guess? Yeah, and there’s definitely one producer – who I won’t mention – who is doing great stuff, and is very good at curating a record, and bringing in big songwriters and players... And he does everything but the dirty work – which is kind of fucked. Then again, there have been different ways of doing things over the years – I mean, Frank Sinatra and Elvis didn’t write their own songs! I am a control freak – I like to get my hands dirty, and get upset and excited about the record; I go through all these phases – the emotions of making the album, which I think is important; and then you really appreciate the music. Well, with a remix I’ll start with an a cappella – nothing’s precious, and I’m able to build around that vocal. But it can also work like that on the originals: some people will send me an a cappella and I’ll build around it. Other times, it’s part of a drafting process starting with a chord progression, and then I shop very simple instrumentals to vocalists and say, ‘I hear your voice on this; try three or four takes and melodies’. I focus in on the content more, but there are so many ways to do it. Sometimes I’ll talk to a folk singer or a songwriter and they may have unfinished songs that I can take and pick up where they left off – and sometimes it’s more of a Nashville style: two people in a room. It’s pressure, but you force each other to stay focused. Songwriting to me is all about the chord progression; and quite often it’s just three of four simple chords. Sometimes just a straight organ sound is a very useful way to start – nothing too fancy. Tracking is always a tricky job, so I use the Waves Vocal Rider on my original songs, which is really useful for evening things out in the mix; it saves you maybe an entire day of mixing vocals. What advice can you offer to anyone starting out in this part of the industry? Learn to mix harmonically. You want songs to talk to each other for the groove – to interact with the records, and the key has to match. I make dramatic intros and outros so there aren’t key clashes, so one pitch will be rising while another pitch is descending; you don’t want two competing keys fighting against each other, believe me! You used to have to prepare stuff ahead of time, setting your cue points here and there, and so on, but now you can just trigger it on the fly thanks to DAWs like Ableton, and easily remember what the right parts are between the two elements. These days, you can manipulate the stems any way you want, and make it as complicated as you want; you can create your edits on the fly, and you know what, it’s fun to just pass stuff out and find a happy accident!